Every year, the World Bank benchmarks all economies based on how easy it is to do business in any given country. As demonstrated in this article, doing business, dealing with construction permits & registering property is very easy in the Baltic nation of Estonia. Getting credit on the other hand is much more complicated. This is where Peer-2-Peer lending comes into play. EstateGuru’s mission is to bridge the gap and make property business in Estonia as easy and smooth as possible. EstateGuru offers borrowers the opportunity to utilize from their great business opportunities AND lenders a safe option to invest in property. Why are investors turning to Estonia? Estonia is a progressive business environment with an efficient and compatible infrastructure. The country’s e-services, mobile communications and internet applications are among the most progressive in the world. The attractiveness of Estonia is demonstrated by the large number of foreign investors doing business within the country and the dominance of world-renowned foreign companies in several of Estonia’s economic sectors. Thus, as the country continues to strengthen its economic growth due to the increase in direct foreign investment, the level of real estate demand will also increase and remain buoyant. As demand increases, so will the value of properties in Estonia meaning local and foreign investors will be making sound investment choices for the future. This represents a prime opportunity to not only invest in real estate but for businesses developing real estate properties. I want to develop properties but cannot raise finance from a bank. What should I do? After the credit crunch and the recession, the risk appetite of banks has significantly reduced, meaning that banks have drastically tightened their lending criteria. Banks have strict lending guidelines, thus hardly borrower friendly and thereby many loan applications are commonly rejected. Banks each have their own individual criteria for deciding which businesses are likely to have their applications for a loan approved or rejected. Encouragingly these criteria generally favor companies and individuals that have clear business goals and are perceived as trustworthy, particularly by demonstrating their commitment to compliance and accountancy. But what if you or your company does not meet these stringent borrowing terms? Where do you turn to? Have you considered P2P borrowing? EstateGuru is the leading Nordic lending platform that is willing to help companies that are denied bank financing, despite their strong business plan and solid collateral. EstateGuru empowers the local borrowing and investment scene through peer to peer lending. Peer-to-peer lending websites can be thought of similar to matchmakers, pairing up people who want to earn a great return on their money, with those who want to borrow it – at a rate they both agree on. EstateGuru makes it easy for companies to borrow funds to finance their project. The potential borrower is expected to provide details of the project and complete a funding application which needs to be approved. Once it has been approved, the project will be made available on the platform for investors to invest in. The opportunity is usually open for a week and investors can keep investing until the financial target has been met. Interested in pursuing a business opportunity but traditional bank loan is not an option? 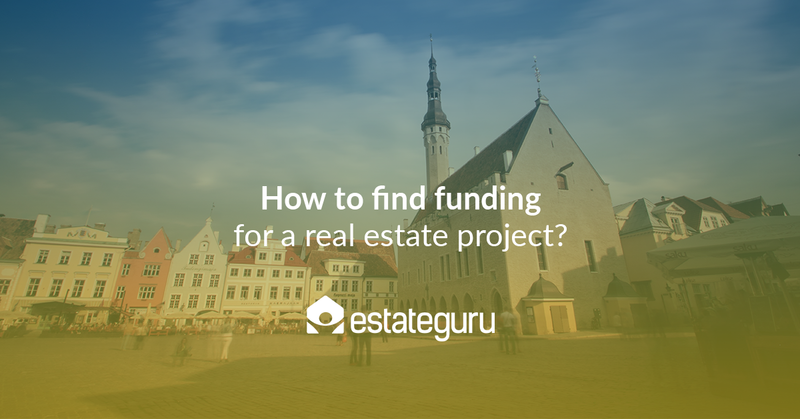 Find out more about getting funding with EstateGuru here.